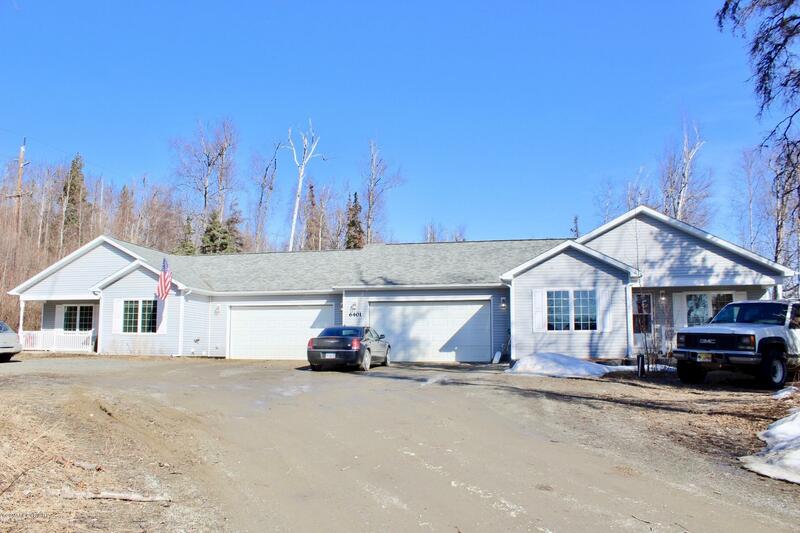 6401 S Wassim Circle, Wasilla, AK.| MLS# 19-5349 | Mossy Oak Properties | 907-357-5100 | Wasilla AK Homes "For Sale" Alaska Businesses "For Sale"
SxS Ranch duplex on an acre+ level lot at the end of a quiet residential cul-de-sac near Settler's Bay. Each unit features 3BRs, 2BAs, 2 car heated garage plus guest & RV pkg. Covered front porch, huge shared back yard w/mature trees & plenty of space to fence or add storage. Generous kitchens w/brkfast bar & casual dining. Open living room w/gas Fireplace. Interior laundry-washer/dryers stay! Excellent opp for owner occupant or income property. Well maintained inside and out with convenient easy-care vinyl siding to keep the curb appeal looking sharp year-round. Unit #1 has been recently updated with trendy new luxury vinyl plank flooring in the kitchen/dining areas and accessible improvements including a ramp from the garage to interior and a roll-in shower in the master bath. Long term tenant resides in Unit #2- almost 9 years currently on a month to month lease.